Last week we concluded our discussion on the force of gravity within our solar system. Today we’ll turn our attention to the subject of gravity on Earth and exploring the physics behind falling objects. We’ll start off by discussing potential energy as it relates to gravity, or the latent energy acquired by an object when it’s been elevated above ground level. Potential energy was the term adopted by 19th Century Scottish scientist William Rankine to represent the latent, or masked, energy hidden within objects. As an example, let’s say you’ve placed your favorite coffee mug in its designated spot on the kitchen shelf. Sitting there so still you wouldn’t dream it was brimming with gravitational potential energy, but if your cat came along and brushed against it, sending it freefalling to the floor, your mug would quickly become a projectile, gaining speed at a uniform rate as it accelerated towards ground level. Where did that once passive little cup acquire its mounting energy? Simply by virtue of the fact it had been lifted by your arm and placed in an elevated position. You see, Earth’s gravitational pull is forever exerting its invisible tug on objects. It was tugging at the mug as you lifted it, and the higher you lifted it, the more gravitational potential energy the mug received. Once perched on the shelf it bridled with latent energy, only to be set free when the cat caused it to lose its support. This equation states that the mug’s gravitational potential energy, PEgravitational, is a factor of its mass, m, Earth’s gravitational pull, g, and the mug’s height above ground level, h.
Within the scientific community g is referred to as Earth’s acceleration of gravity, a phenomenon commonly accepted to be the uniform accelerating rate at which an object falls on Earth, equal to 9.8 meters per second per second, or meters/second2. It represents a rate of constant acceleration, which happens to be precisely the same whether the object falling is a brick, feather, or coffee mug. 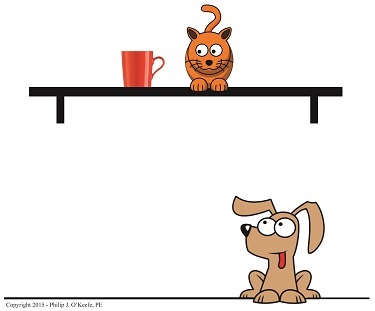 Next time we’ll work with the potential energy equation which will enable us to see how the curious orange kitty sets loose the latent power held within that mug. Last time we discovered that Earth zips around the sun at the mind boggling speed of 29,680 meters per second. This is the final bit of information required to calculate Fg, the gravitational force exerted upon Earth by its sun, as set out in Newton’s equation on the subject and derived from his Second Law of Motion. We’ll calculate that quantity today. where Earth’s speed, or orbital velocity, is the v in the equation. The other variables, m and r, have previously been determined in this blog series. For a refresher see Centripital Force Makes the Earth Go Round, What is Earth’s Mass, and Calculating the Distance to the Sun. Earth’s mass, m, is valued at 5.96 × 1024 kilograms, while r is Johannes Kepler’s astronomical unit, equal to about 149,000,000,000 meters. That’s scientific notation for 7,930,000,000,000,000,000,000 pounds! 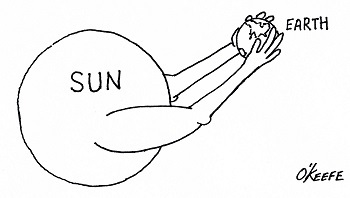 That’s the amount of force exerted by the sun’s gravitational pull on Earth. Seems about right — right? 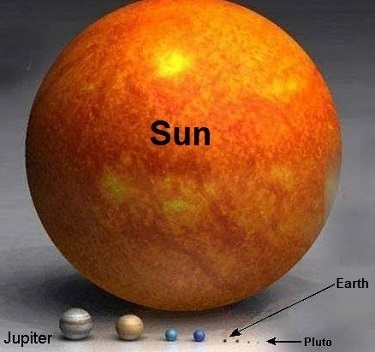 Now that we know Fg, we have everything we need to calculate the mass of the sun, which in turn enables us to determine the mass and gravity of other planets in our solar system. We’ll calculate the sun’s mass next time.